The new Adobe Stock marketplace offers 40 million royalty-free, high-quality, curated photos and graphics to jump-start your creative projects. And because it’s integrated into the 2015 lineup of Creative Cloud apps, you can spend more time designing and less time searching for and managing your stock images. World-class content - Need a graphic for your comp or a layer for your composite? Search 40 million of the world's most beautiful images and graphics via Adobe Stock to find the perfect asset for your project. 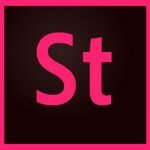 Integrated right into your apps - The Adobe Stock service is built right into your favorite desktop apps, so you can add images to your Creative Cloud Libraries. Thanks to Adobe CreativeSync, you can immediately access your images across your desktop and mobile devices and even share them with your team. In-app purchase - Start with watermarked images to see how things look in your comps, and then buy the high-res versions right from inside your app. No more jumping back and forth between browser and app — just a few clicks and you're done.